Adding two or more DocuClocks on a LAN is easy. Simply designate one machine a timeserver and install ClockWatch Server. The individual computers running DocuClock would also run ClockWatch Client software. The timeserver gets its time periodically from the Atomic Clock. Individual DocuClocks get their time from the timeserver. Everything happens automatically in the background and uses the existing LAN hardware and system software. 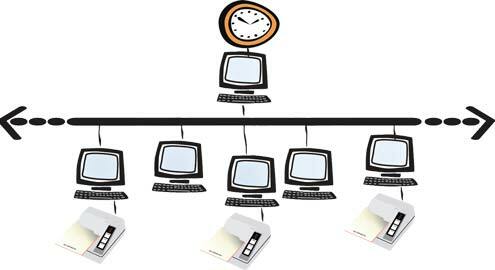 In the diagram, ClockWatch Server is servicing the time requests from workstations running ClockWatch Client. ClockWatch Server also keeps the computer it is running on set to the correct time by accessing an external timeserver over the Internet. The trader's applications use the correct time maintained by ClockWatch Client. The DocuClock time stampers provide precise time stamps on order slips. ClockWatch Server is installed as an application (or as a background service) on the computer which acts as the enterprise-wide timeserver. This timeserver can be any PC on the network and can be continued to be used as a regular PC. ClockWatch Server is listening on the LAN / WAN for client requests. ClockWatch Server makes periodic calls to the NIST to keep the time accurate on the computer it is running on. To make the connection it uses the native Internet connection or dials the NIST directly over the phone line. Independently, a workstation running ClockWatch Client can synchronize to standard time from Server over the LAN or WAN using the sockets protocol. Server responds to each client with correct time, logging client request. Since clients don't need to talk to timeservers on the Internet, traffic is reduced and the integrity of corporate firewalls is maintained. Every time an order slip is printed, it gets the exact time from the client computer. DocuClock Serial or DocuClock Parallel time stamper with free ClockWatch Client conversion option. For more information: contact us at 1-877-845-2549 for a free consultation.